Soft credits are a familiar concept to many fundraisers, and are useful for a better understanding of the sources of contributions received by your organisation. They allow you to assign credit for a donation to one or more people who are not the donor. CiviCRM's soft crediting allows users to assign soft credit types to contributions. Assigning an appropriate reserved or custom soft credit type enables administrators to properly attribute contributions received through one or more charitable contribution types (such as Donor Advised Funds, Scholarships, Family Bequests, etc) whether solicited (P2P) or not. Lets say that a very active member of your organization was responsible for getting 10 other people to make a contribution. Soft credits provide a way for you to credit this person and the actual donor, without counting the contribution twice. You can use CiviCRM's soft crediting to credit parts of a donation to multiple people. In the screenshot below, you can see that we have credited Magan Cooper's contribution of $1,500.00 to three different people. The community foundation is the donor. Joe would receive the solicited soft credit. This scenario is illustrated in the screenshot below. As well as recording soft credits, we can also report on them. The contribution detail report has optional columns which show soft credit details. When checked, these will show four extra columns in CiviReport, which can be used to view soft credit information. When creating a contribution page you will have the option to allow your end users to make a contribution on behalf of an honoree. 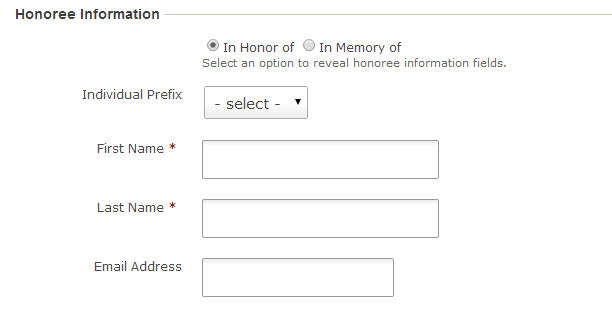 To do so you must select the Honoree Section Enabled checkbox. 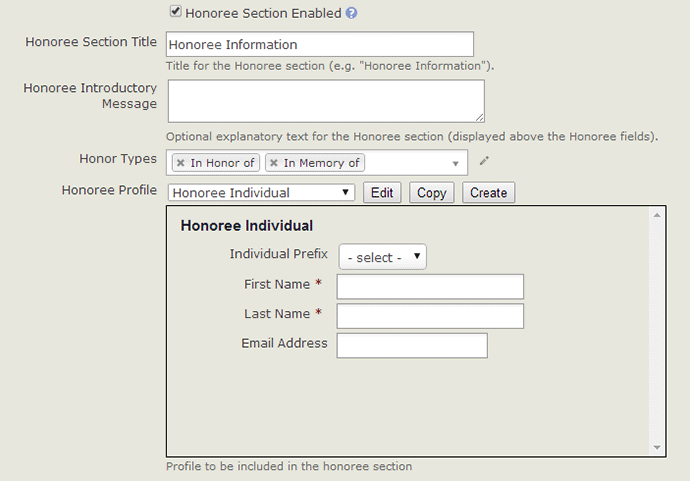 This will reveal additional fields that will allow you to specify the Honor Types and Profile to be included in this section. Once configured your end users will be able to enter honoree info for online contributions. CiviCRM will check to see if the honoree exists within CiviCRM already using the default duplicate checking rules on your site, if a duplicate is not found a new contact record will be created. A soft credit will be added to the contact record of the honoree. The concept of soft credits is closely related to personal campaign page. When someone donates by a personal campaign page, their donation is soft credited to the owner of the personal campaign page.